Urns Through Time, A source of ceramic urns, funeral urns or funerary urns. FAQs. What size cremation urn will I need? The general rule is that you need one cubic inch of urn space for each pound of the persons weight. Most urns created for cremation ashes are oriented to an approximate 220 cubic inch capacity to accommodate most sizes. We however offer 180+ for the average person, 220+ for a larger person and 375+ as a companion or double size. When you say we create Custom Urns, just how much input does the customer have? All choices are wide open to the customer. You may choose an extremely innovative format that starts with a personal concept. You may choose a specific style and then determine the color, texture and embellishment that fit the personality of deceased. Or anything in between. No two lives are exactly alike, why should two urns be exactly alike? We have a system to guide the customer through the ordering process and a way of communicating and confirming communications at each step. Keepsake urns are in essence small models of full size urns. They are meant to hold a small portion of the cremation ashes. Many families purchase several so that a loved one's ashes can be divided among those living far apart. We make keepsake urns to complement any of our urns in groups or individually. What is the best way to seal a cremation urn? You can choose to not seal your urn if the ashes are to be place inside using a sealed plastic bag, however should you choose to seal the lid, it can easily be sealed with a good quality silicon sealant which can be found at any home depot or hardware store. Simply apply a bead of sealant around the inside of the lid, and then securely fasten the lid on to the cremation urn. If you wanted to someday remove the lid, it is possible if done carefully by a strong person. Simply, twist the lid back and forth until it releases. How does one send you a picture to place on the urn? Can it be e mailed? Yes, you can email your photo, be sure to identfy it with the name you use for the order. Photos can also be uploaded from the Urns Through Time web page. Or you may always send the photo through the US mail. If you would like you can place your order by email or phone. Just give us a call we will be glad to assist you.. I like the Photo cat urn, but before I make a purchase,can you please tell me if it is possible to add a line with dates on on the urn? How much extra would it cost? It's very common to add dates to the inscription. And generally we don't charge anything for one additional line of inscription. Just add a comment with instructions. What is the size of the urn for the 180 lbs person- how tall is the urn, how wide? Generally it is 1 cubic inch per pound. So a standard size urn is approximately 180 cubic inches or just over 3 quarts and will hold the remains of a person up to 180 pounds. Most urn are about 10 to 15 inches high and 7 or 8 inches wide. The large size urns are 220 cubic inches or just under a gallon and are a little larger. However we can make your urn what ever size you would like if it is very large there maybe a small additional charge. Do you wholesale your urns? Can you tell me how much the slot machine urn would cost and is it wood? Custom urns are priced base on the amount of work required to produce them, so it hard to say before you tell us what you want. We do give you an up front price however so you will know the cost before we make the urn. Just send us an email and we can start the process of designing and pricing your urn. 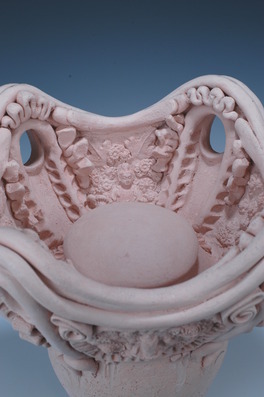 And no we only make ceramic urns. Do you ship to the UK? if so how long will it take? Yes we ship to the UK and Northern Ireland and it takes 6-10 days.